Landscaping is a task that combines science and art. Armed with horticultural knowledge, as well as familiarity with the elements and principles of landscape design, a landscape professional can help you transform your property. The landscape architect, designer or contractor you choose to work with will guide you through the landscaping process, which consists of a design and construction phase. The biggest mistake DIYers make is rushing into the construction phase without a plan. Landscape plans turn ideas into visuals and ensure that scale and layout have been thought through prior to construction. 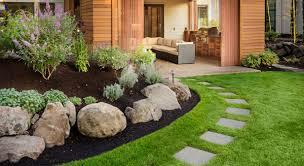 Your landscaper will create a plan for your yard that suits your needs and provides solutions to common landscaping problems, such as slopes, wind, sun or lack of space.